In 2011 Alma de Colores was created as one of the Centro Maya programs encouraging inclusive employment and socializing for people with disabilities in San Juan La Laguna and municipalities around Lake Atitlán. The initiative originated out of the need to create employment opportunities which offered training and respectable jobs as well as providing services and generating development for the community. Currently, the program directly benefits twenty-five individuals and indirectly assists 100 users who receive therapy at the Center. Alma de Colores is made up of five production and educational areas: artisan crafts which encourage use of local seeds and weavings, sewing, utilizing recycled fabrics to produce innovative products which are useful personal items, such as coin purses, shopping bags, aprons, etc. And there is a cafe-lunch counter which promotes eating locally by offering vegetarian entrees, contributing to a healthy diet. In addition, there is a bakery which produces whole grain bread from dough using minimally processed ingredients. And there are organic gardens where vegetables are produced that are served in the cafe and restaurant. These generate a concern for the environment, take advantage of the natural cycles inherent in polyculture farming which protects the lake and the soil, avoiding the introduction of pollutants. This part of Alma de Colores also serves as a demonstration tool for other organizations, schools and people, particularly those interested in learning about environmental sustainability theory and practice. Solidarity, inclusion and respect for others are the underlying order in Alma de Colores such that we surround ourselves with becoming acquainted with every part of the project thus favoring a unique experience in values and social responsibility. It is for this reason that one of this geographic area’s strength is the promotion of tourism which is accomplished by providing tours which introduce San Juan La Laguna’s culture and the five aspects of the Alma de Colores’ program. 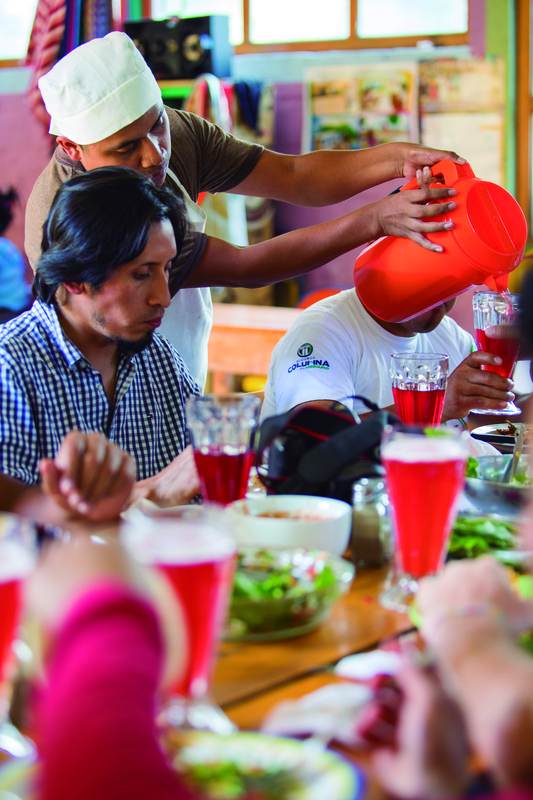 The aspects of Alma de Colores’ programming are focused on responsible community tourism, and in so doing, introduce a different way of healthy living, taking care of the environment and benefiting the community through consumption of locally produced products. Additionally, tourists have the experience of becoming acquainted with the Mayan culture of the Tz’utujil . And they learn about the importance of supporting small initiatives designed for development of the Tz’utujil’s own community, generating a positive impact and joining the synergy of solidarity with the most vulnerable. Alma de Colores envisions becoming a model for social business which can be replicated at national and international levels in order to contribute to the recognition of the rights of people with disabilities and to contribute to diminishing poverty world-wide so that in the end, beneficiaries will receive therapy, fair pay, transportation, food, assistance with personal health/health care and interest-free loans which can be used to pay for education and business ventures.